Women who worked full time in wage and salary jobs had median weekly earnings of $657 in 2009. This represented 80 percent of men's median weekly earnings ($819). Of the 45 million women who worked full time in wage and salary jobs, 17 million were employed in education and health services, and 5 million were employed in wholesale and retail trade. Financial activities and professional and business services each employed about 4 million women. Median weekly earnings of women employed in education and health services were $717, which was 77 percent of men's median weekly earnings in that industry. In wholesale and retail trade, women's median weekly earnings were $523 (76 percent of men's earnings). 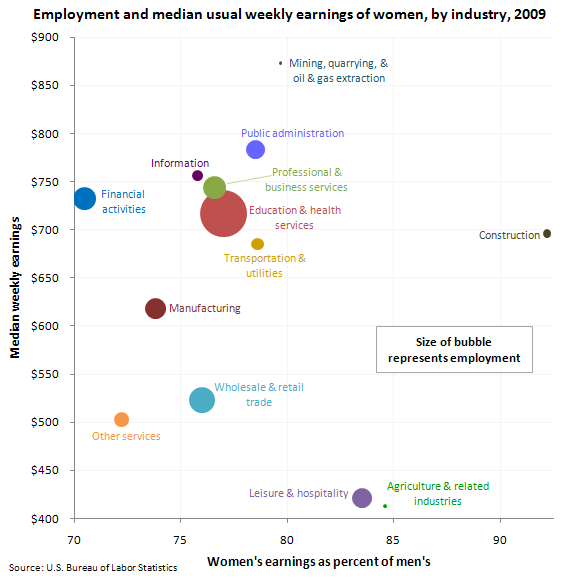 Median weekly earnings of women employed in mining, quarrying, and oil and gas extraction ($873) and public administration ($783) were substantially higher than the earnings of their counterparts employed in leisure and hospitality ($421) and agriculture and related industries ($413). Women's-to-men's earnings ratios were higher among women employed in construction (92 percent) and agriculture and related industries (85 percent) than among women employed in other services (72 percent) and financial activities (71 percent). These data are from the Current Population Survey. To learn more, see Women in the Labor Force: A Databook (2010 Edition), BLS Report 1026, December 2010. Bureau of Labor Statistics, U.S. Department of Labor, The Economics Daily, Women’s earnings and employment by industry, 2009 on the Internet at https://www.bls.gov/opub/ted/2011/ted_20110216.htm (visited April 21, 2019).